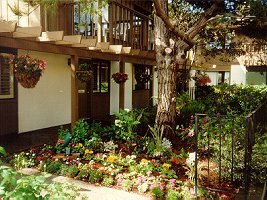 Located in the heart of town, the Adobe Inn is only steps from Carmel's gourmet restaurants, exquisite shops, art galleries and just a short walk to the Pacific Ocean and Carmel's beautiful beaches. Created with every comfort in mind, the rooms are warm and inviting, providing an atmosphere of luxury. Spacious and well appointed, the rooms of the Adobe Inn feature fireplaces, balcony or patio, wet bars, and refrigerators. Some rooms have ocean views. A continental breakfast is served fresh, each morning, delivered to your door, along with the morning newspaper. Room service is also available. The Inn also provides underground parking, a heated pool and sauna. Adjacent to the Inn is the Adobe Inn House of Prime Rib/Bully III English Pub and Restaurant. 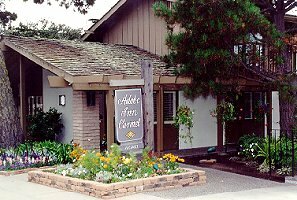 Whether you're looking for a romantic getaway, a family retreat or merely an escape from the busy workaday world, we at the Adobe Inn invite you to join us and experience Carmel at its finest.